Forty stream segments in Rhode Island, U.S.A., were examined seasonally from June 1979 to March 1982. Thirty-nine species of macroalgae were collected, respresenting 25 genera. 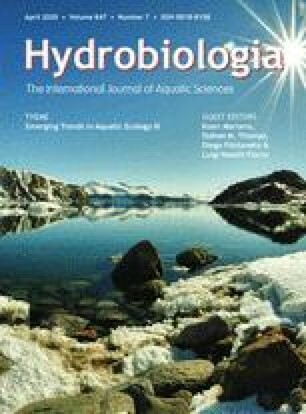 The composition of the lotic flora was 54% green algae, 31% red algae, 5% blue-green algae, 5% xanthophytes, 3% chrysophytes and 3% diatoms. The majority of these taxa (85%) were filamentous. From a biweekly examination of five stream segments, macroalgal communities could be grouped according to light regime. Species in unshaded streams exhibited little seasonality, whereas in streams shaded by one or more layers of riparian canopy, maxima in species numbers and abundance occurred during colder seasons. The most widespread and abundant species were the blue-green alga Phormidium retzii, the green alga Draparnaldia acuta, and the diatom Eunotia pectinalis. P. retzii and E. pectinalis were aseasonal annuals, while D. acuta was primarily a winter-spring form. It appears that pH is a major factor affecting broad geographic distribution patterns of stream macroalgae, whereas the light regime established by overhanging canopy is an important factor which influences localized abundance and seasonality of lotic macroalgal communities. Niche pre-emption appears to be a common mode of resource space division among stream macroalgae in Rhode Island. E. pectinalis is the strongly developed dominant in this drainage system. 1.Department of BotanyUniversity of Rhode IslandKingstonU.S.A.